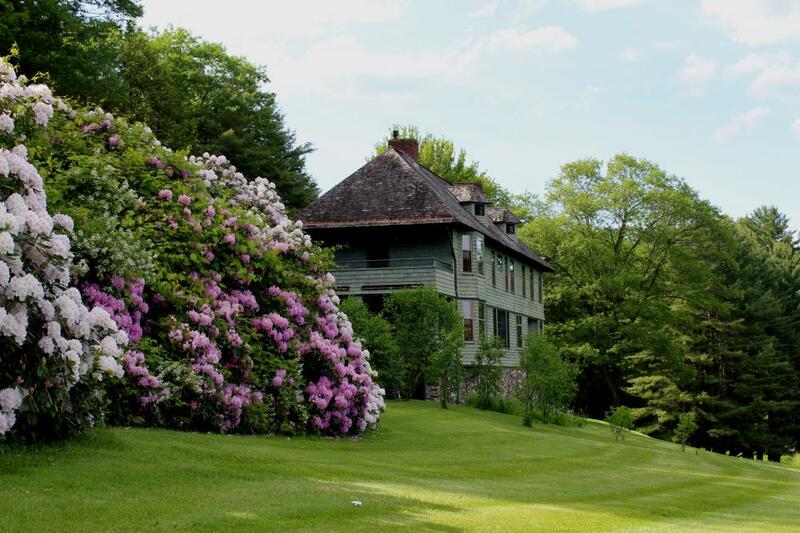 Take a special one-hour guided tour of Nobel Prize winning author Rudyard Kipling’s former Vermont estate, Naulakha, when the spectacular 100-yard multi-colored rhododendron tunnel, leading out to a spacious stone patio, is in full bloom! See and learn about Naulakha, the authentically restored main house where Kipling wrote The Jungle Books and Captains Courageous, among others. Visit the Kipling Carriage House, also one of The Landmark Trust USA’s five historic vacation rentals, and the Barn Museum, once home to Kipling’s team, Nip and Tuck. Enjoy tea on the back deck after the tour, and feel free to wander the grounds to see the irises in bloom and the private clay tennis courts located below Naulakha (the first tennis courts built in Vermont). No dogs, please. Kelly Carlin, Operations Manager for The Landmark Trust USA and Scott Farm giving an inside tour of Naulakha. Four guided tours, each limited to 20 people, will be offered on Wednesday, May 29 and Thursday, May 30 at 10 and 11:30 am; 1 and 2:30 pm, rain or shine. Tours are $35 per person and fill quickly! Enjoy a picnic on the grounds, at our picnic tables or on the stone patio by the pergola. Brown bag lunches are available and need to be pre-ordered at the time of registering for your tour. Register online at https://landmarktrustusa.org/events/tours/ or by calling 802-254-6868. 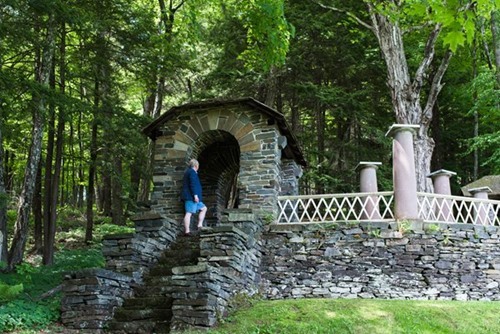 The stone pergola connects to Naulakha via the 100- yard rhododendron tunnel. Located in Dummerston, near Brattleboro, Naulakha, one of seventeen National Historic Landmarks in Vermont, is otherwise not open to the public unless as a vacation rental. Unfortunately there is no guarantee that the rhododendrons will be in full bloom at the time of the tours since that is up to Mother Nature, but it is typically the time when they do bloom. 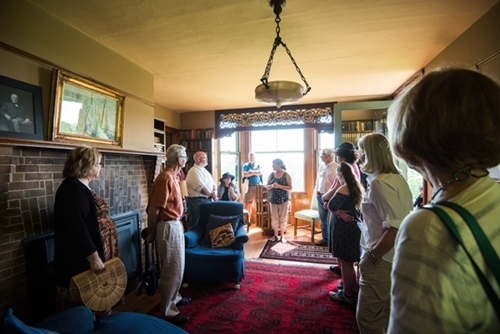 Proceeds from the tours will go to advance the work of The Landmark Trust USA. Pam Knights Communications enjoys working with The Landmark Trust USA to help promote and grow this tour, now an annual fundraising event. Karen & Brian Zecchinelli of the Wayside Restaurant winners of the VT Restaurateur of the Year Award! 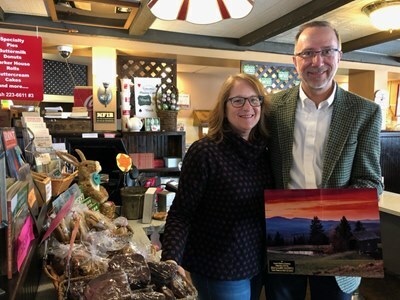 Congratulations to Brian and Karen Galfetti Zecchinelli, owners of Vermont's Wayside Restaurant now in its 101st year of operation, winners of the 2019 Vermont Chamber Restaurateur of the Year Award honoring restaurateurs who continue to demonstrate excellence in restaurant operations and management. It is a pleasure to work with such dedicated and innovative restaurateurs! Kudos also go to Chef-owner Sarah Natvig of The Black Krim Tavern in Randolph, VT for Chef of the Year, and to Peter McLauren of West Hill House B&B in Warren, VT for Innkeeper of the Year. Brand development and strategic marketing are an important investment in the health and growth of one's business, and over time can yield some exciting results. 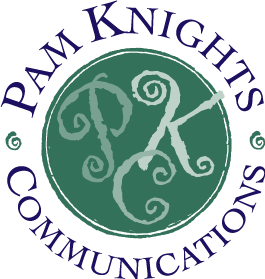 I'd like to share some of Pam Knights Communications 2018 highlights with you. 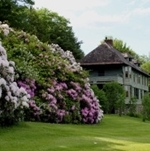 On May 30, The Landmark Trust USA in Dummerston, VT offered its 1st Annual Estate Tour with a Rhododendron Display at Rudyard Kipling's former Vermont home, Naulakha, now a year-round vacation rental property. The Wayside Restaurant, Bakery & Creamery in Montpelier, VT celebrated their 100th Anniversary on July 29 with a customer appreciation event featuring an ice cream social and fireworks. Several VT dignitaries were in attendance. On October 9, Scott Farm Orchard in Dummerston, VT hosted their 16th Annual Heirloom Apple Day featuring talks and tastings with Orchardist Zeke Goodband, apple picking, live music, dry stone wall tours by The Stone Trust, and local food vendors. That same weekend, Cedar Circle Farm & Education Center in East Thetford, VT hosted their 16th Annual Pumpkin Festival with horse-drawn wagon rides, pumpkin picking, live music and performances, kids activities and organic food concessions. In September, New York Times Bestselling Author Archer Mayor of Southern VT released Bury the Lead, the 29th novel in his acclaimed Joe Gunther crime series. PKC helped to promote his many author appearances throughout VT, NH, MA and NY. Preparations are in the works for promotion of his benchmark 30th novel, Bomber's Moon, due out this fall. In November, acclaimed New Yorker magazine cartoonist and Vermont's second Cartoonist Laureate, Edward Koren of Brookfield, VT, released a new book, Koren. In the Wild, published by Button Street Press. This collection of cartoons, featuring his signature hairy, humanoid and bold creatures coupled with his keen wit, beautifully captures the duality of rural and urban life while gently poking fun at it. 2018 was a great year for PR! Having truly unique and newsworthy angles to work with makes my job lots easier, as does developing good relationships with the media. I was fortunate to have the opportunity to promote some very exciting milestones this past year. Here are some highlights. Seven Days' Eva Sollberger attended the Wayside's Customer Appreciation Event held on July 29, 2018 to produce this Stuck in Vermont video, episode 543. The 100th was widely publicized on Vermont Public Radio, WCAX, ABC 22, WPTZ, New England Cable News, CNBC, Associated Press, US News & World Report, Newsday, The Best of Central Vermont magazine, Vermont Magazine, Burlington Press Press, and The Bridge, among others too numerous to mention. To say the least we we're thrilled with the coverage! October 2018 marked the 100th anniversary of the 1918 Spanish Flu, the deadliest epidemic in history that killed 50-100 million worldwide. 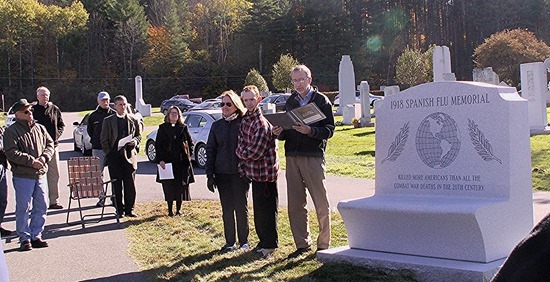 To honor Brian Zecchinelli's grandfather who was a Barre, VT victim, the Zecchinelli family commissioned a 4-ton Barre Granite "Reflection Bench" that was dedicated on Oct 26 at Hope Cemetery in Barre. The story received extensive coverage by New England Cable News, NBC, Associated Press, US News,The Valley News, The Times Argus, and Best of Central Vermont magazine, among others. 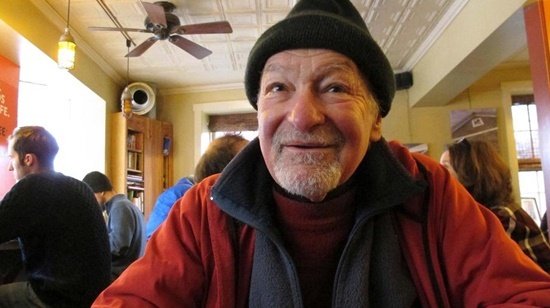 In November and December, Ed Koren enjoyed widespread national publicity for his new book, Koren. In the Wild, spurred by Lisa Rathke's Associated Press article and Jane Lindholm's VPR Vermont Edition interview. A feature article, Drawing Analogies by Maria Buteux Reade came out in the March/April issue of Vermont Magazine, and other stories in Columbia Magazine, Prattfolio, and other NPR stations are in the works. 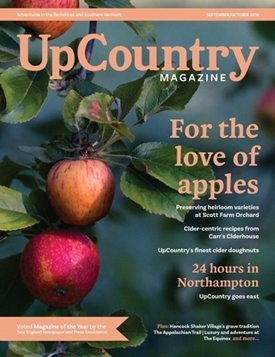 Scott Farm was featured In the September/October issue of UpCountry Magazine, on the cover and in an article written by Natalie Wise. The story focuses on Orchardist Zeke Goodband and the cultivation of more than 125 varieties of heirloom apples grown on the 571-acre farm in Dummerston, VT. Scott Farm, owned by The Landmark Trust USA, operates a farm market and a wedding and event venue, and offers a fruit CSA, and pruning-grafting, cider making, and baking workshops throughout the season. A feature story is in the works for the Sept/Oct 2019 issue of Vermont Magazine. Pam is grateful for the opportunity to work with such wonderful and interesting clients and extends a special thank you to Kelly Carlin at Scott Farm Orchard, Karen and Brian Zecchinelli at the Wayside Restaurant, Bakery & Creamery, Margot Zalkind at Button Street Press, and Kate Duesterberg at Cedar Circle Farm & Education Center, among others.